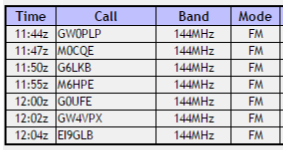 M0PLA/P SOTA Activations: 18th March 2017. GW/NW-018 SOTA Activation visit. GW/NW-018 Moel Llyfnant. 18th March 2017. Grid SH 808352. Altitude 751M. Our first visit to Moel Llyfnant which we saw a few weeks ago when we activated the summit next door (Arenig Fawr). The weather was not on our side today as visibility was down to about 30 yards at best. The rain was already coming down as we arrived at around 10.10 a.m. We parked by the gate at Nant Du just off the A4212 (marked with blue circle on map below), we sorted our gear and walked the 1.6 miles down the small track until we reached the disused farm house (marked with the red circle on the map below). From here we followed the track around to the right and headed up the hill. The journey from the farm house to the summit was around 1 hour 10 minutes, the wind was getting very strong and driving the rain horizontally across our path. (we were getting very wet at this point). We had brought with us 2M Dipole as usual and HF endfed but with the wind and weather being so bad we decided just to activate 2M. We were set up in a few minutes and started to call CQ at around 11.42 a.m. Our first call arrived nearly right away with GW0PLP (Don) followed by a further 6 QSO's and my first 2M FM contact to Ireland, this was helped along with Don informing me that there was an Irish station trying to call me. (A very big thank you Don). After only 20 minutes of operation we had decided to call it a day as Jamie and myself were soaked. We started out descent at 12.15 p.m. and arrived back at the car at around 13.35 p.m. a lot quicker going down with some idea where we were heading.